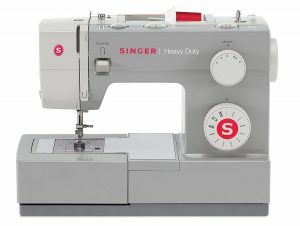 As an inexpensive, simple and sturdy sewing machine, Singer Heavy Duty 4411 is a great tool to get your daily sewing chores done, but it doesn’t come without its faults. 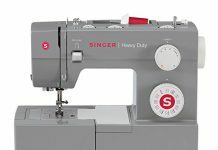 I don’t say this lightly, but Singer 4411 feels like watered down version of Singer 4432 (Read review HERE) but at a very, very similar price point so this review will be also a comparison between the two sewing machines. Just like 4432, this sewing machine rocks that old-school look with gray hard plastic shell and a mechanical build which I like. You will be able to sew leather, vinyl and multiple layers of denim, although that’s a little bit challenging with this sewing machine, people have reported the sewing machine having trouble with more than 2 layers, you might need to be patient. 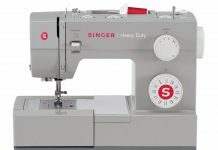 Almost a copy paste from 4432 model, this sewing machine has a hard plastic shell with metal insides for longevity and endurance, and a stainless steel sewing bedplate which makes feeding sewing machine your fabric a breeze. So even as a newbie, you will be able to make a professional looking product. Another similar feature that this model shares with it’s older brother, 4432, is a see-through bobbin window which makes it so easy to monitor the amount of thread you still have left. No more surprises at the end of sewing. 4411 only has 11 stitches to choose from which limits what you can do with the sew and means that you will outgrow the sewing machine much faster. 4432 model has 32 stitches for comparison. This alone might make you consider going for something a little bit more serious. Another huge minus is that 4411 does not come with an automatic needle threader, so if you’re used to set up your sewing machine quick, you won’t have that extra here. Singer 4432 does have an automatic needle threader which makes the life of sewers that much easier as it removes eyestrain. Performance wise, the sewing machines have the same motor so speed is set to 1,100 stitches per minute which is pretty good. You will be able to sew leather, faux leather, multiple layers of denim, vinyl and other fabrics. Is Singer 4411 worth your money?